This is my second time reviewing this character within about a month. 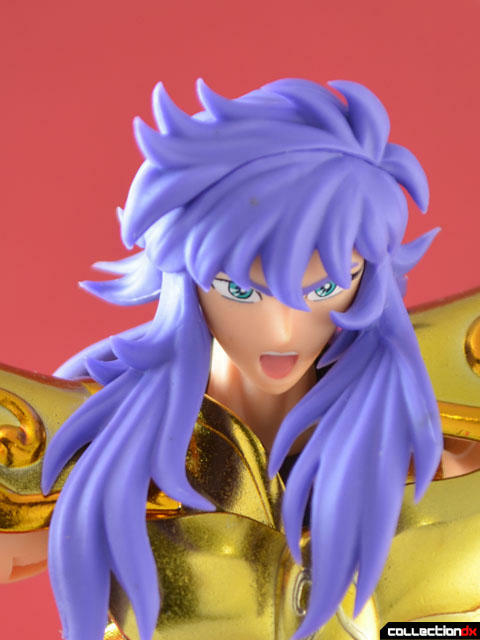 If you want to see my thoughts on the orginal Saint Cloth Myth release for this character, you can check it out here. Scorpio Milo is the guardian of the House of Scorpio. Each of these houses is a line of defense for the inner part of Sanctuary where the Pope (of Sanctuary, not the Catholic faith) and Athena reside. Scorpio Milo squares off against Hyoga, who decides to fight Milo in order to allow his friends to continue in their race to save Athena, whose her death draws near. 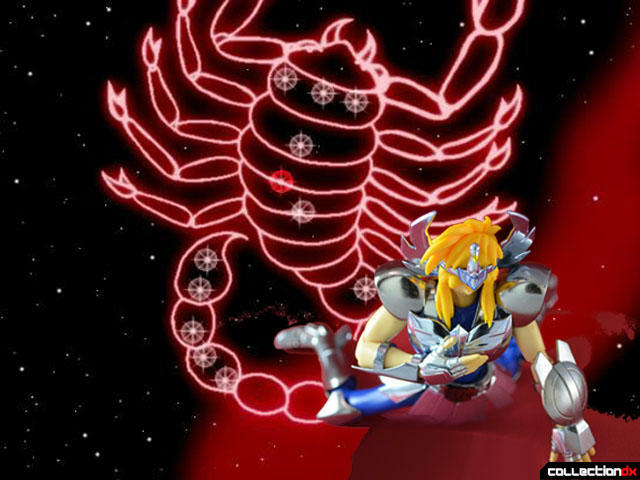 During the fight with Milo, Hyoga receives Milo’s signature attack, the painful and deadly Scarlet Needle. This attack injects poison into the victim that causes them to scream in pain as their body slowly loses all five senses and culminates in death when Milo deals the final attack. Milo pierces Hyoga in fourteen points of his body corresponding to the fourteen stars of the Scorpio constellation. Milo realizes, however, that as he had landed the final strike of the Scarlet Needle, Antares, Hyoga had landed fourteen attacks of his own (in the same pattern as the Scarlet Needle) on Milo’s body. Milo admits that his victory is a shallow one, as he won the fight only due to the protection of the Scorpio Cloth. Recognizing Hyoga’s strength, Milo heals Hyoga’s wounds, thus allowing the Bronze Saint to continue his journey. Milo does not make another major appearance in the series until the Hades Chapter, when the Specters of Hades are trying to infiltrate Sanctuary to take Athena’s head. During this time, Milo confronts Kanon, the brother of Gemini Saga who, like his brother, also betrayed Athena. Milo does not accept that Kanon has changed his ways in order to join team Athena. Milo decides to deal Kanon punishment fit for a man who betrayed Athena and Sanctuary, death by Scarlet Needle. During the process of slowly killing Kanon, however, Milo comes to accept Kanon's motives as true. 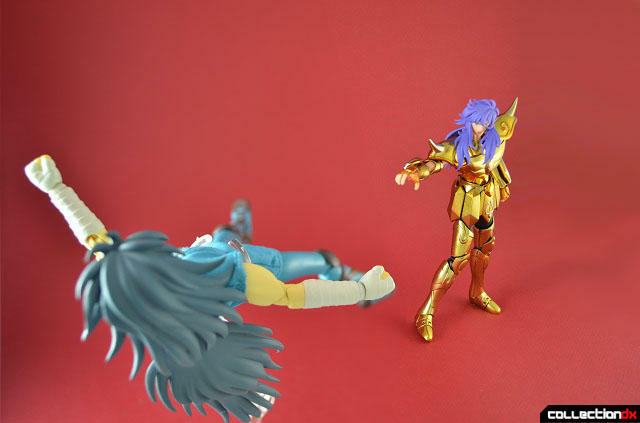 Milo allows Kanon to live in a gesture similar to how he spared Hyoga’s life. Later, Scorpio Milo joins forces wtih Aries Mu and Leo Aioria in order to stop three of the specters that continue to advance past the Twelve Houses of the Sanctuary. These specters turn out to be the resurrected Gemini Saga, Aquarius Camus, and Capricorn Shura. These fallen Saints are hell-bent on taking Athena’s life. 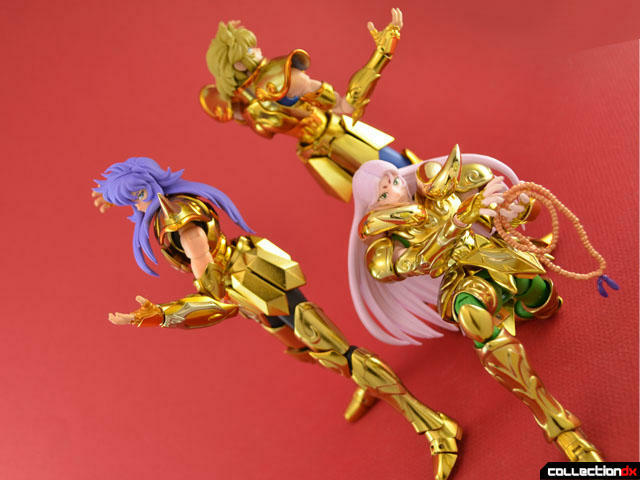 Faced with no other option to defeat the three Gold Saints that stand in their way, Saga, Camus, and Shura decide to use the most powerful technique which can only be performed by three Gold Saints: the Athena Exclamation. They know full well that they will forever be branded as traitors if they use this attack, which had been deemed forbidden due to the enormous destructive power it can unleash. They did not count on the fact the Milo, and Aries would also be willing put everything on the line to save Athena, as they counter with their very own Athena Exclamation. What follows is a huge spoiler for anybody who has not watched the show, so I won’t ruin it. Suffice to say the battle ensues and some cool stuff happens, and then some more cool stuff happens. 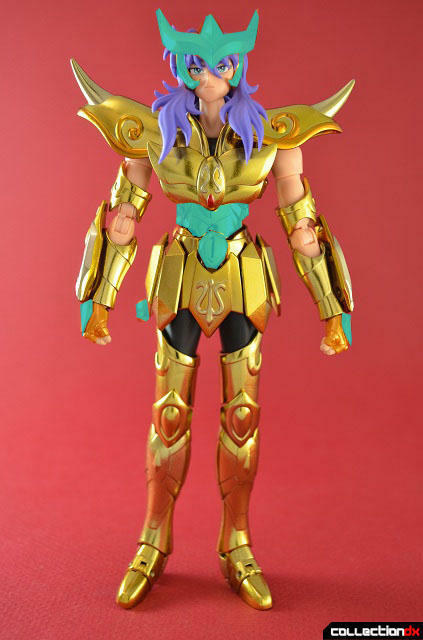 Since this is and EX release, we get a box that is very different from the boxes of the main Saint Cloth Myth line. There is a glossy sleeve that covers the box. The front of the sleeve has a sticker on it indicating that it comes with some special goodies that I will get to later. The rest of the box has the usual shots of the product information and all that good stuff. Look at that picture! That is the most unenthused Scarlett Needle I have ever seen. The actual box is printed to look like the Pandora boxes in which the Saints would store their Cloth in the Saint Seiya series. All of the sides are the same as the previous EX releases, save for the front that has the Scorpio logo on it. The build of the object mode is a lot tighter and more imposing looking than the original release. The claws on the scorpion for this release are much bigger than the original release and more accurate to the anime. Bandai achieved the larger claws by simply creating a separate pair of claws for the Object Mode. In the original release, the claws that were used on the object mode were the very same that would embedded into the arm guards of Scorpio’s armor, which is why Bandai made them small, to satisfy both purposes. Overall, this Scorpio Milo looks gorgeous in his Cloth. Bandai toned down the orange trim that was present on the armor of the original release which, although it made the armor pop a little more, was not accurate to the series. Bandai also did not include some of the extra symbols they had taken the liberty of adding to the orginal release, which is good because they made the original release a bit tacky. What we are left with is not only the most anime-accurate Saint Cloth Myth representation of the Scorpio Cloth, but also an elegant, golden, clean piece. Like the other EX releases, the Scorpio Milo EX is heavy on the metal content. TThe only pieces of the armor that are made of plastic are: the headpiece, the scorpion’s tail, the armor that goes around the abs and lower back, the jewel piece that fits over front of the waist armor, and the covers for the hand armor. 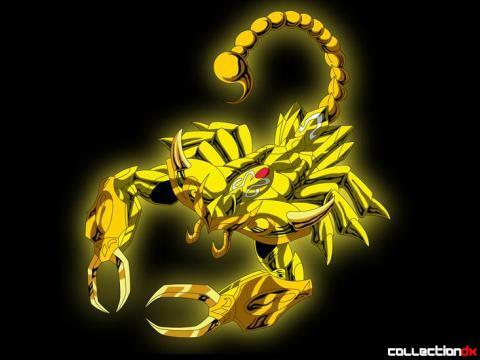 Scorpio’s armor shares the same great engineering of the other EX Gold Saints. I only have two things about the armor’s design that bothered me. First of all, the two piece of the waist armor that clasp in the front of the figure are not perfectly aligned. The jewel piece does not pop in perfectly, but this is a minor issue since the jewel stays on okay and does not look out of place. The thing that was really annoying about this figure is that the jewel goes directly over the arm of the front skirt. If you move the skirt upwards, you will knock the half-sphere out of place. The EX Aries Mu also has a similar design with a diamond shape on the front of his waist armor, except with him Bandai used two arms to attach the front skirt to the waist armor. These two arms were far enough apart that the skirt could be raised up and clear the diamond piece without knocking it off. Why Bandai didn’t do the same thing for Scorpio is beyond me. This design goof limits how much you can move his legs forward without knocking off the half-sphere piece. Getting him to kneel properly in his armor is pretty much impossible. When I saw that Bandai had gone back to having the scorpion’s tail on the headpiece composed of individual moveable links like they did with the orginal release, I shuddered at the thought of having the tail come apart when I moved it too much. That, however, was not the case because this time around the links hold together really well. We once again get a nice three-piece two-colored plastic cape with this EX Gold Saint release. This is one of the big selling points for the EX line, as the plastic capes are not only more anime accurate than the orginal release's cloth capes, but also allow for more dramatic posing. And six and a half pairs of hands. With the release of the Gemini Saga EX, Bandai gave us a glimmering hope that all of the Saints in the EX line would include effects parts to simulate their signature attacks, as Saga came with a Galaxian Explosion effect part... Then the effect parts were MIA for the next two releases, which begged the question, did Bandai pull the old bait and switch? The answer is yes and no. While Leo and Aries did not come with any effect parts, Scorpio comes packed with glossy effects sheets for himself and the other two Gold Saints. These effect sheets are meant to slide into the holders that the EX Stands come with. I personally don’t have a problem with Bandai including the sheets with Scorpio Milo, since I plan on buying all of the EX Gold Saints. I do feel for those who are cherry picking what they buy from the EX line, since they will miss out on the effects sheets if they don’t pick up Scorpio. The one part of this figure I have mixed feelings about is the head. The face is a bit longer and thinner than the appendix for the original, which has a superior sculpt. Also, his hair does not look as full as it does in the other releases or in the anime. On the flipside, the reduced hair (which is now segmented into three parts: front and back that make up the main hair piece, and lower back hair which plugs into the neck) allow Milo to move his head a lot more from side to side than either the original or the appendix head could achieve. Since the EX line is trying to walk the fine line between accuracy and articulation, it is easy to see how Bandai decided to trade in some excess hair for extra range of motion. As for articulation, Scorpio hits all the key poses in his Cloth. Well, that’s about it all his moves, really. So all around this is a good release in the EX line, though Bandai is straying a little from the expectations in sculpt and armor design that were set by the first releases in the line. These issues are by no means deal-breakers in my book, as you still get the most accurate and posable Scorpio Milo figure to date. Plus, if you have Leo and Aries, you now have the means of recreating your own Athena-freakin’-Exclamation!! Need I say more? 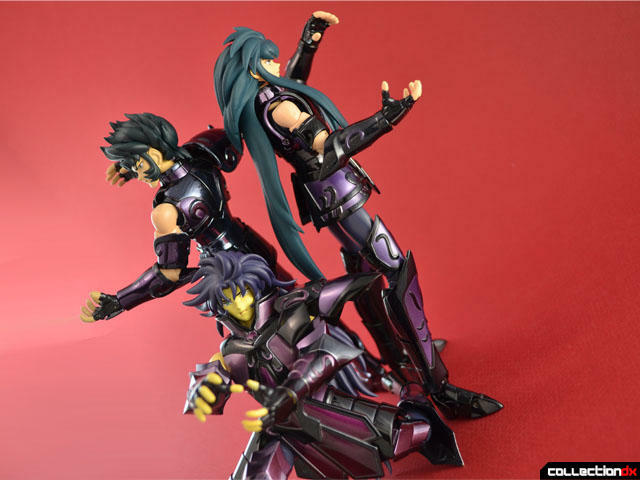 A special thanks to my buddy Joe for letting me borrow his EX stands and Hyoga for this review! also im suprise by the amount of metal pieces on this one :O woow! well anyways great review! You know, I really hated the neutral face when the first pictures of the EX Scorpio began to surface. But I have learned that they usually look better in person than in picture. After getting Scoprpio and playing around with him, I have made peace with the fact that the face does not look as good as the Appendix's face, but it is still tons better than the original release's face. I am guessing they are using a different face sculptor for the EX line, which is why they look pretty different from the previous releases. It is neat how the guy used a piece of a jack to use as the connector. I would have never thought about doing that. I might give it a go with the Scorpio Appendix.